Rock the reels with Swedish power metal band Sabaton and Play ‘N Go – with 5 reels and 10 paylines, this energetic title comes with metal stacks and mystery symbols, chained reels, last stand wild reels and free spins with stacked symbols, linked reels and mega symbols for huge wins. 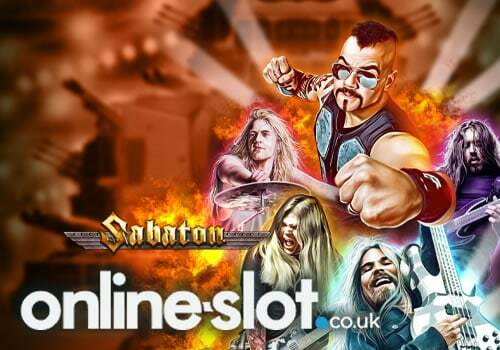 Sabaton is a 5 reel, 10 payline slot from Play ‘N Go which is based on a rock band. Available to play on all devices such as smartphones and tablets, you join lead singer Joakim to benefit from metal stacks and mystery symbols on each spin. With chained reels to showcase the same symbol on up to 3 reels, there’s a Battalion Spins feature where you get free spins with 3 linked reels for huge rocking payouts. Based on the legendary Swedish power metal band of the same name, you will see what appears to be a tank behind the reels – symbols include low value weapons such as grenades, swords, bullets and Roman helmets. You’ll also see the members of the band which are the higher value symbols. The highest value rocker is worth 10 times your stake for 5 on a payline. Joakim, the lead singer, is the wild symbol and replaces all symbols bar the scatter – 3, 4 or 5 symbols will give you 10, 15 or 100 times your stake respectively. You’ll also benefit from the Metal Stacks and Mystery Symbols feature on the reels – 1 of them is chosen randomly on each spin as a stack of that symbol is added to the reels. When it comes to Mega Symbols, all band members can appear bigger for enhanced payouts. The Chained Reels feature may trigger randomly on every spin – either 2 or 2 adjacent reels will display the same symbols for bigger wins. These take place on the 3 middle reels – i.e. reels 2, 3 and 4. There’s also a Last Stand feature which is also randomly activated – 1 or 2 reels are chosen to give you wild reels. Sabaton is all about the Battalion Spins feature – this is played when you get 9 Sabaton cross scatters on the reels. With 7 free spins awarded, a symbol is chosen randomly to become the Metal Stacks and Mystery Symbol for the whole feature. You can also retrigger the feature to give you 7 more free spins. Reels 2, 3 and 4 will always be linked and display the same symbols as Mega Symbols can land each free spin for bigger payouts. Lastly, if you get between 3 and 8 scatters (not enough to trigger the Battalion Spins feature) in the base game, the Mystery Symbol feature is triggered which converts the scatters into a random symbol. Highly volatile, Sabaton is all about the Metal Stacks and Mystery Symbols feature – this carries through to the Battalion Spins feature where the bigger wins will come from. If you’re lucky, you could win 5,000 times your stake! If you like the rock theme, Play ‘N Go’s House of Doom is also worth trying.